131 Beacon is located on the south side of Beacon, between Arlington and Berkeley, with 129 Beacon to the east and 133 Beacon to the west. 131 Beacon was built ca. 1860, one of two contiguous houses (131-133 Beacon) built at about the same time in the same design. Two other houses, 127-129 Beacon, in a similar style, were built slightly later, ca. 1861. Three different builders constructed the houses: James Standish built 127 Beacon, John Danforth Dunbar built 129 Beacon, and Samuel Shurtleff Perkins built 131-131 Beacon. In each case, after the buildings were completed, the land was acquired by the builder from William Goddard and T. Bigelow Lawrence, and then the builder resold the house to its first occupant. Click here for an index to the deeds for 131 Beacon. On October 9, 1861, 131 Beacon was purchased from Samuel Perkins by Rev. Christopher Toppan Thayer, a Unitarian minister. He and his wife, Augusta (Brewster) Thayer, made it their home. Christopher Thayer had served as minister of the First Parish (Unitarian) in Beverly, retiring in 1859, after which he and his wife had traveled abroad. Christopher Thayer died in June of 1880. In his will, he left all of his property to his wife. Augusta Thayer continued to live at 131 Beacon, joined in 1883 by her nephew, William Brewster, the son of her brother-in-law and sister, Oliver Brewster and Anna Maria (Jarves) Brewster. He had graduated form Harvard in 1881, after which he had traveled abroad, returning to study law in the offices of Judge Josiah G. Abbott. William Brewster later become a trustee. Augusta Thayer died in September of 1884. In her will, she left 131 Beacon to William Brewster, and he made it his home. By the 1888-1889 winter season, William Brewster had been joined at 131 Beacon by his widowed mother, Anna Maria (Jarves) Brewster. She continued to live with him until her death in July of 1900. William Brewster continued to live at 131 Beacon in 1909, but had moved to 302 Marlborough by 1910. 131 Beacon was not listed in the 1910 Blue Book. 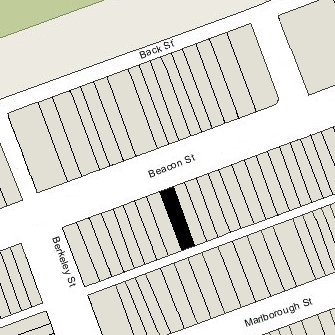 In May of 1910, at the time of the 1910 US Census, 131 Beacon was the home of chemical manufacturer William Ross Warren and his wife, Helen (Van Voast) Warren. They had lived at 187 Bay State Road in 1909. On July 25, 1910, 131 Beacon was acquired from William Brewster by Olivia Lee (Endicott) Hutchins, the wife of retired wool broker John Hurd Hutchins. They previously had lived at 262 Beacon. J. Hurd Hutchins died in April of 1930. Olivia Hutchins continued to live at 131 Beacon. Their son, John, lived with her. In the mid-1930s, they were joined by her sister, Mabel Endicott, and their mother, Mary Elizabeth (Chapman) Endicott, widow of insurance broker George Munroe Endicott. She continued to live at 131 Beacon in 1942, but had moved to an apartment at 250 Beacon by 1943. 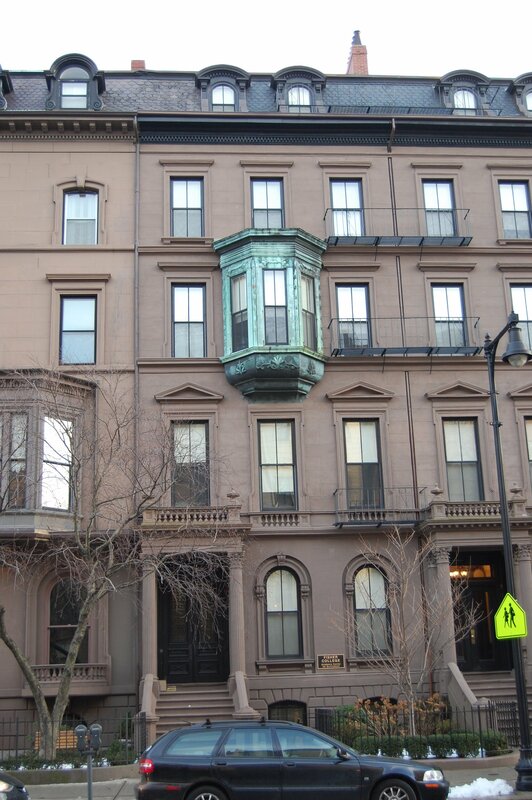 On November 8, 1942, 131 Beacon was acquired from Charles R. Lynde by Shirley Clifford Speed, a real estate dealer who converted many Back Bay houses into lodging houses and apartments. By 1943, 131 Beacon was the home of Albert H. Houghton, a real estate broker, and his wife, Emeline Washburn (Ewell) Houghton. They previously had lived in Brighton. He died in March of 1943. Emeline Houghton continued to live at 131 Beacon in 1944, operating it as a lodging house. By 1945, she and several of her lodgers had moved to 2 Marlborough, which had been acquired by S. Clifford Speed in April of 1944. On August 15, 1944, 131 Beacon was acquired from S. Clifford Speed by Elizabeth Krauss and her sister, Catherine (Krauss) Flanagan, the wife of Francis Ford Flanagan. Elizabeth Krauss lived at 141 Beacon and operated lodging houses there and at 115 Beacon. Catherine Flanagan and her husband lived at 139 Beacon where they also operated a lodging house. In October of 1946, they applied to convert 131 Beacon from a single-family dwelling into a lodging house, legalizing its current use. Their application was denied. In January of 1947, they applied for (and subsequently received) permission to install a fire escape on the rear of the house, required to meet egress requirements for a lodging house. After installing fire escapes, in March of 1948, they again applied for (and subsequently received) permission to convert the property into a lodging house. On July 1, 1959, 131 Beacon was acquired from Elizabeth Krauss and Catherine Flanagan by August Anderson Calen, Jr., and his wife, Elsa Cecelia (Dahlstrom) Calen. They lived at 447 Brookline Avenue and operated 131 Beacon as a lodging house. On August 15, 1960, 131 Beacon was acquired from the Calens by Myron Cornelius Fisher, Jr., director of corporate development for Fisher Junior College (founded by his father, Myron C. Fisher, Sr., and his uncle, Edmund H. Fisher). He and his wife, Catherine B. (Schaefer) Fisher lived in Lexington. On July 6, 1961, 131 Beacon was acquired from Myron Fisher by Fisher College. In September of 1961, the college applied for (and subsequently received) permission to convert the property into a dormitory for the school. In November of 1968, Fisher College acquired 133 Beacon, where it maintained a dormitory and dining room. In March of 1975, the college applied for permission to convert 131 Beacon from a dormitory into classrooms, noting that the number of students who resided in dormitories had declined. At the same time, it also sought to convert 133 Beacon into classrooms and a dining room. The applications were denied and Board of Appeal refused to grant the college’s appeal. 131 Beacon remained a Fisher College dormitory in 2015.